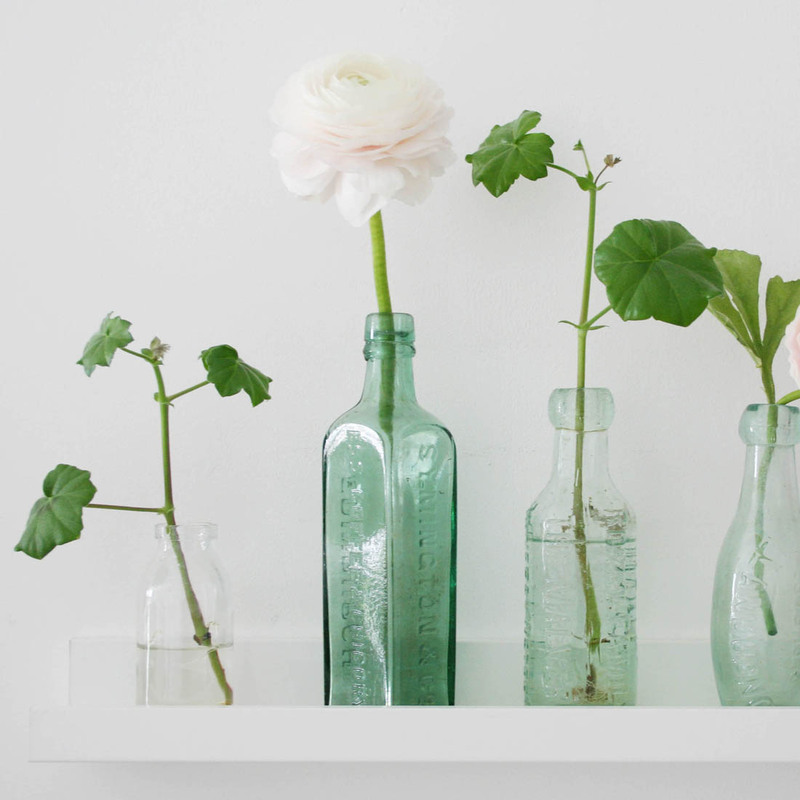 A lovely way of bringing the outdoors in to your bedroom is to use vintage bottles for plant cuttings. I love the smell of Geranium leaves so I cut stems from the plant in my garden and pop them in bottles of water. They grow roots in the water and eventually flower – just change the water regularly and make sure they have lots of light. 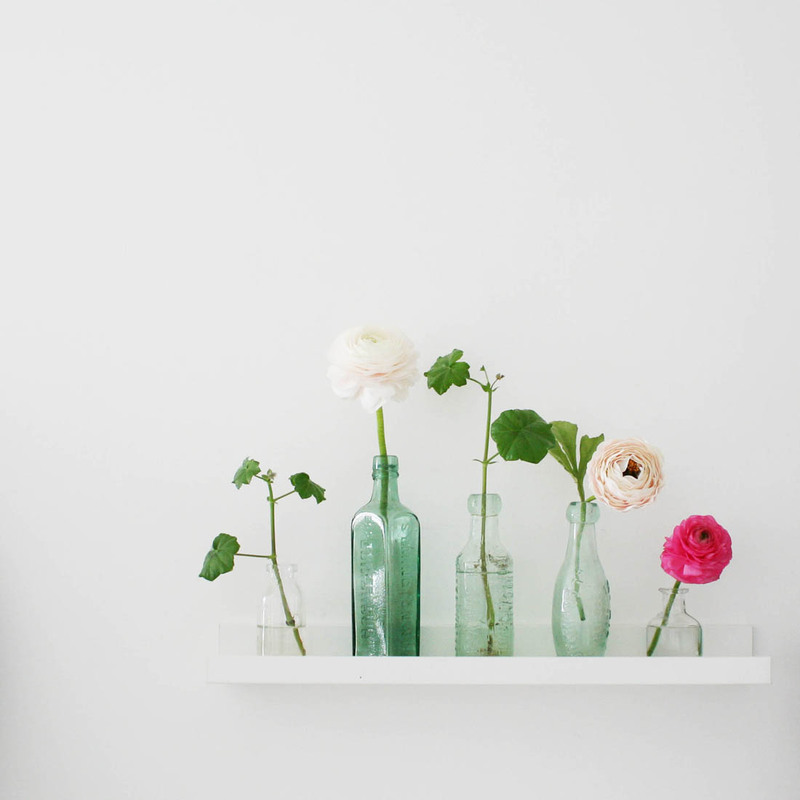 Display them with single flower stems and it’s a really cheap and easy way to have fresh flowers in your bedroom on a regular basis and they look extra pretty in vintage bottles. 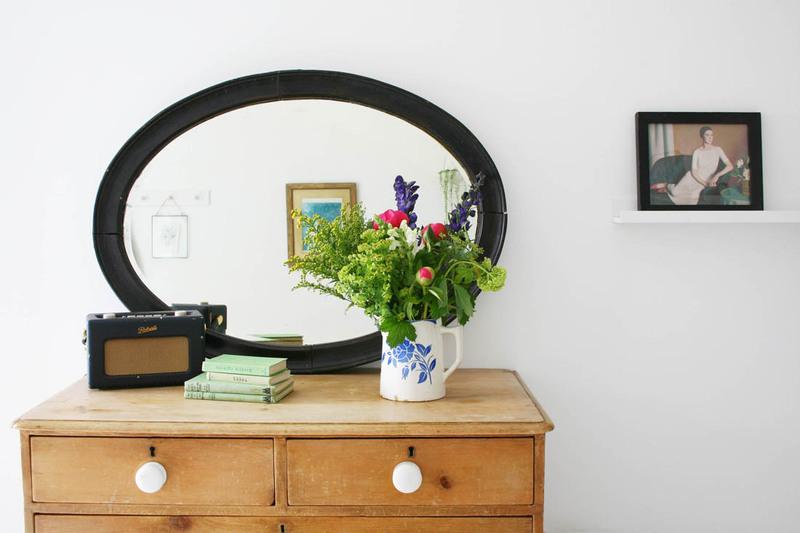 When you go out vintage hunting don’t dismiss floral bits because they look too chintzy or old fashioned, like this floral framed mirror that was originally a dark mahogany wood. All you need to do is get a bit of paint out and choose a colour to match your room. I painted this sweet mirror white and it nows fits in to my room perfectly and subtlety adds to the botanical theme. This was my great grandmother’s quilt and is well over a hundred years old and one of my most treasured possessions. It is always worthwhile checking whether you already own something that will fit in with the theme you have chosen. 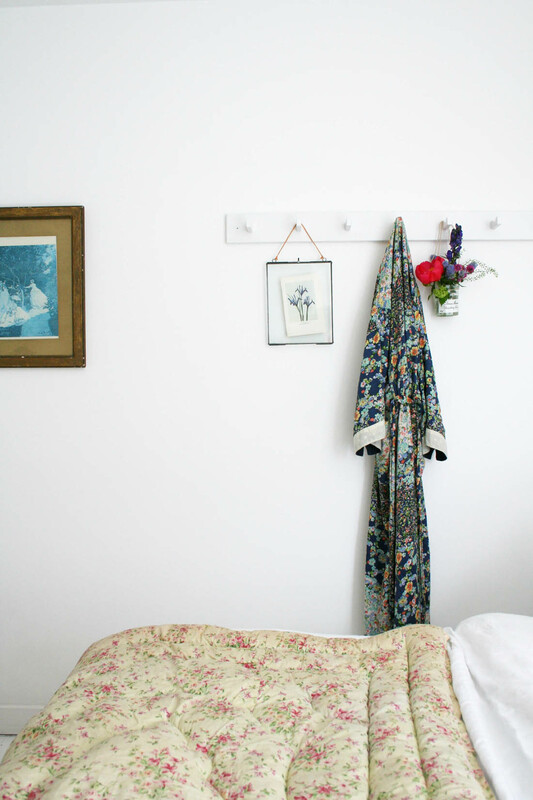 A vintage floral quilt is the perfect way to add a botanical feel to a bedroom and they are just so, so pretty. 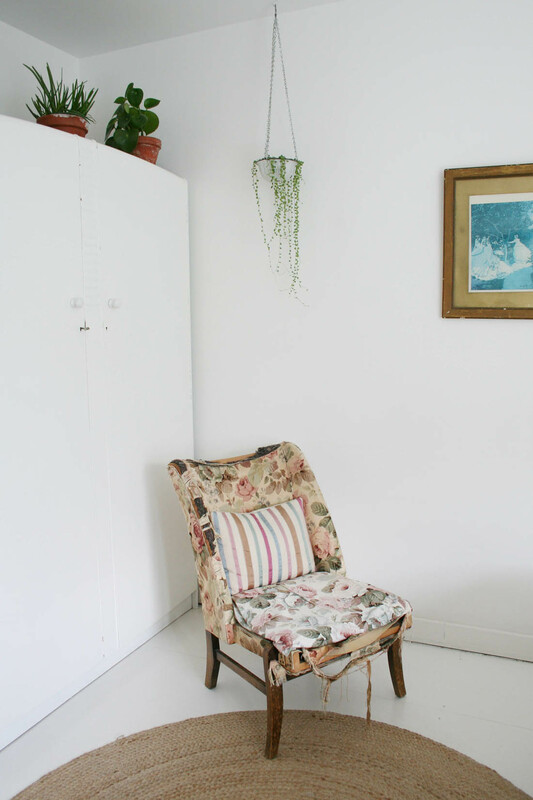 I have lots of hooks in my bedroom to avoid the dreaded ‘wardrobe chair’ – you know, the chair where you dump worn clothes that aren’t quite ready for the laundry – but it’s nice to clear a set to play with different style ideas. 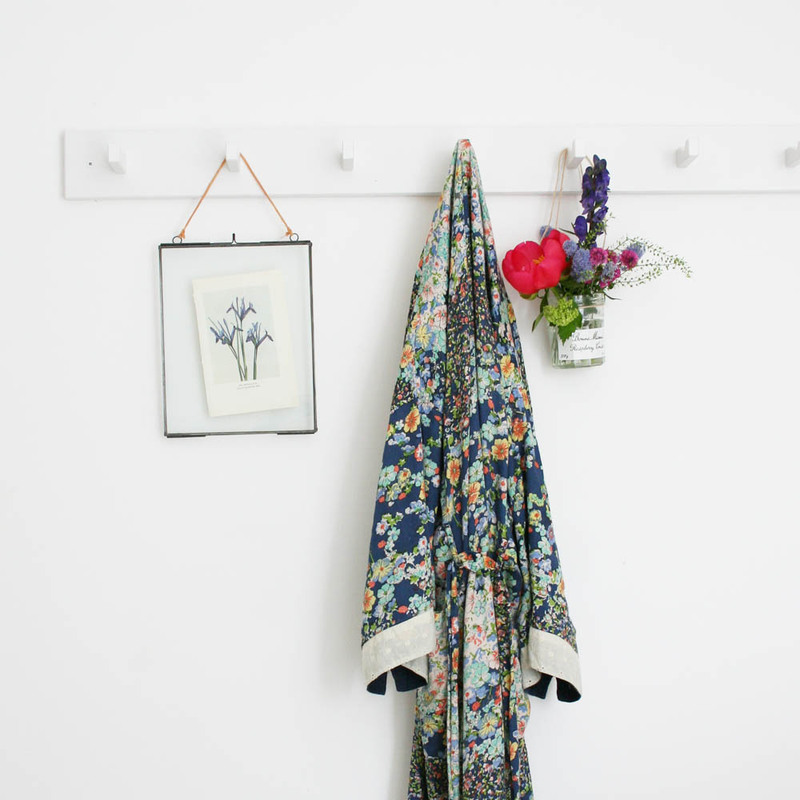 Here I have hung a botanical illustration from a vintage book (it’s really easy to find beautiful vintage botanical books with coloured illustrations and you can remove the coloured plates without spoiling the book and then frame them for your bedroom), a floral dressing gown (or maybe your favourite floral dress?) and a pretty posy of flowers in a jar to add to the botanical theme in my room. 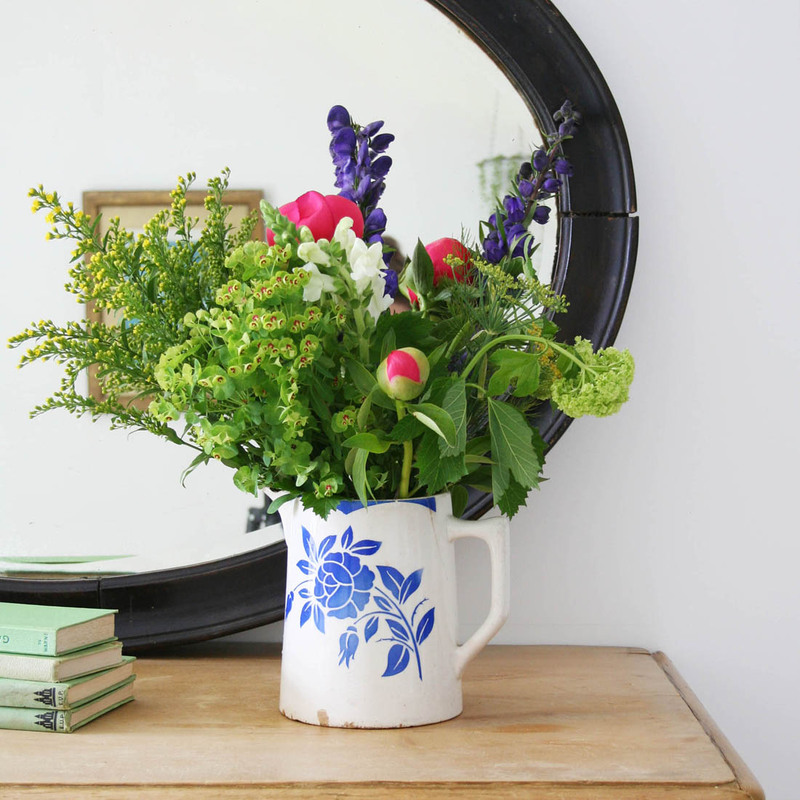 A brilliant way of displaying fresh flowers or plants is to use vintage jugs or bowls. Buy a mix of flowers – a few stems of each – as well as lots of foliage to create a natural looking bouquet and a vintage jug will make them look even better. Vintage bowls or tea cups are also a lovely thing to use for indoor plants instead of stashing them in a cupboard not being used or seen. If you are short of space in your bedroom and there is nowhere to place a pot plant try making a hanging planter. Buy a vintage enamel jelly mould and punch three holes through the lip at equally spaced points. Attach three chains, all the same length, through the three holes. Screw a cup hook into the ceiling and hang the chains onto it. 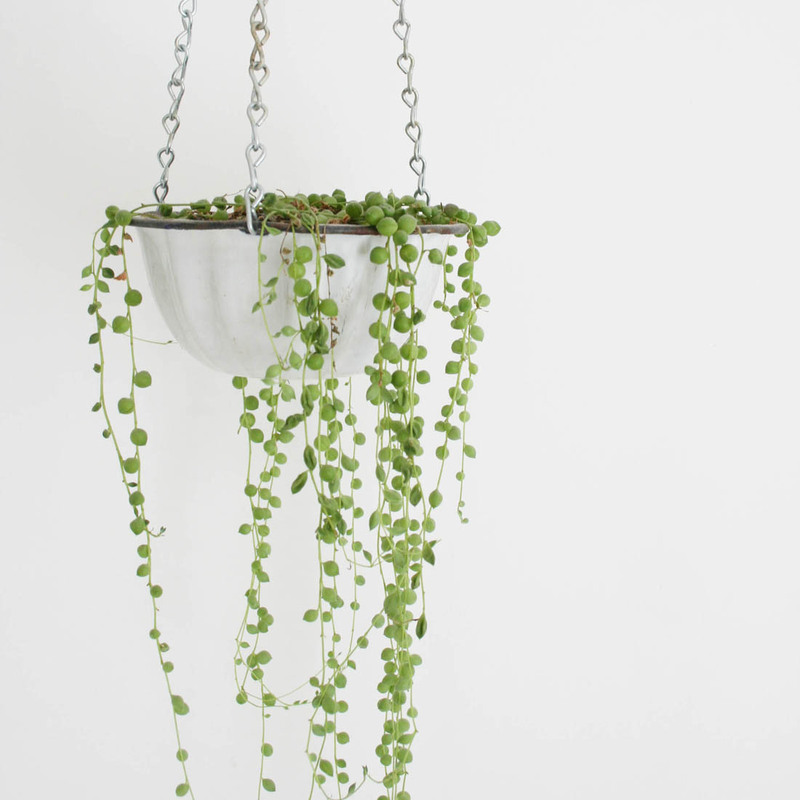 Buy a trailing plant like this ‘String of Pearls’ for the hanging planter and add a few pebbles at the bottom of the planter so that water can drain away. 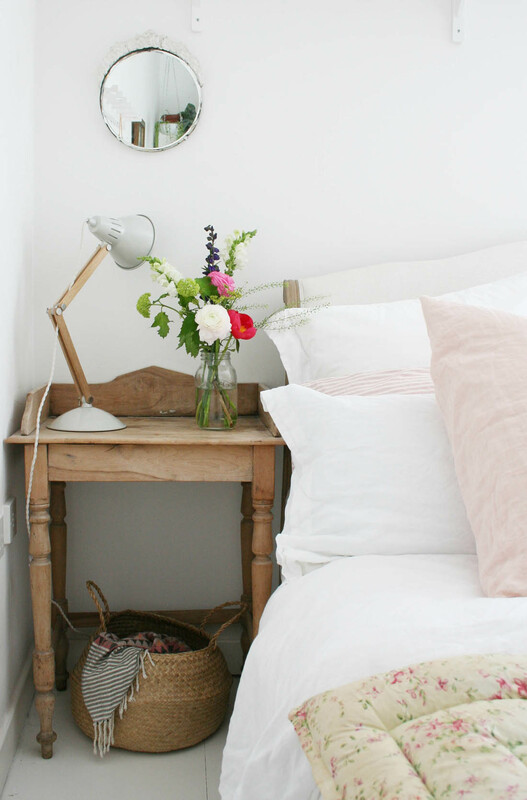 So, there you go, a few easy ways to bring a botanical feel to your bedroom. 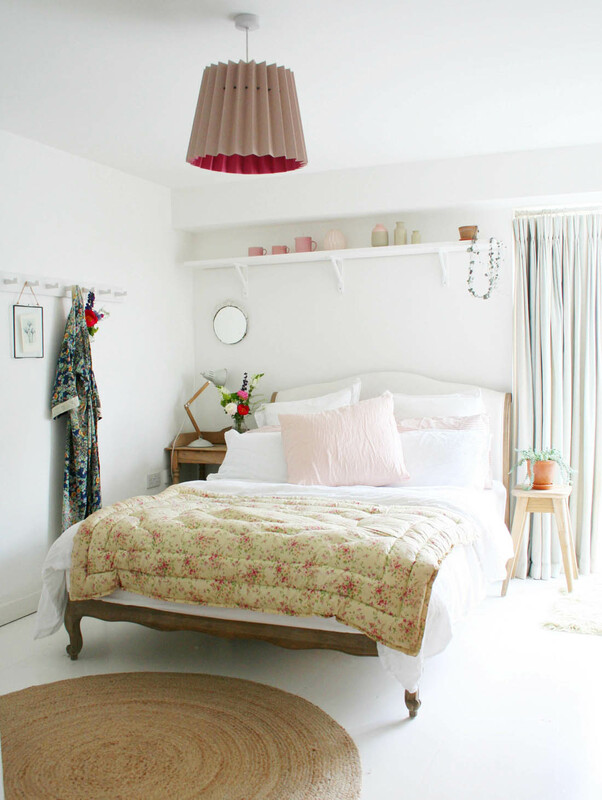 Throughout May there will be lots more ideas for updating your bedroom over on the Bensons for Beds Instagram account where I will also be doing an Instagram takeover. 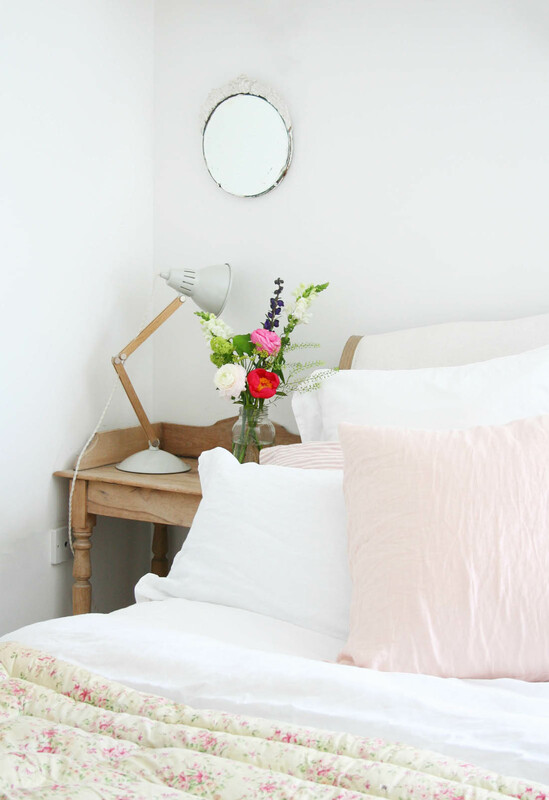 If you are feeling inspired take a snap of your bedroom style on Facebook, Twitter or Instagram, using the hashtag #SpringStyle, to be in with a chance of winning a prize to help you do a mini bedroom makeover. Read the full terms and conditions and more details here. *This is a collaborative post with Bensons for Beds. 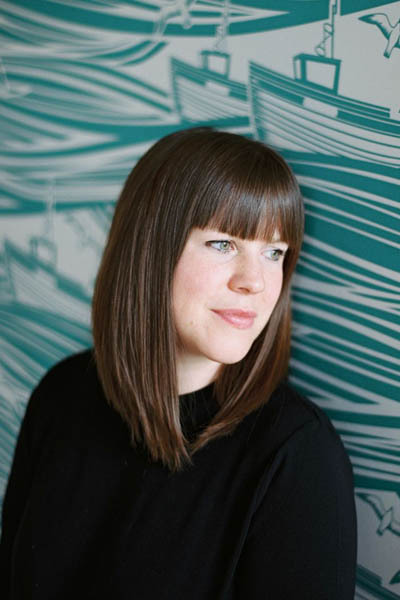 So pretty and restful… some lovely ideas, thank you! Your room looks fantastic! These fresh blooms and pastel floral fabric designs are a great way to give your room a vintage and girly feel. Florals against a crisp white background allow for a very fresh and inviting room. Thanks for sharing! Your room looks beautiful. I like the botanical feel to the bedroom by using vintage finds.